The Colorado Poverty Law Project (CPLP) is a non-profit 501(c)(3) organization with the mission to recruit and coordinate volunteer attorneys to participate in a monthly pro bono legal clinic at the Colorado Coalition for the Homeless (CCH). In partnership with the Denver Bar Association, CPLP provides resources to enable volunteers, at their discretion, to provide a range of services to attendees, including answering on-the-spot questions, providing referrals and, if appropriate, providing limited representation. CPLP has continued to grow the breadth and depth of its services to help the critically indigent tackle legal barriers to avoid or transition from homelessness. 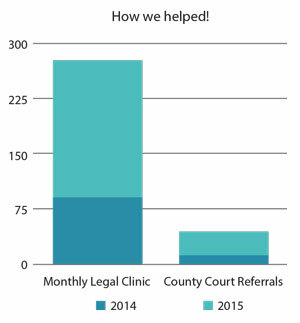 In 2015, CPLP doubled the number of people seen at monthly legal clinics at Stout Street Health Center, launched the Pro Bono Eviction Program, facilitated two continuing legal education trainings on eviction issues and hosted its first fundraiser event. During 2015, CPLP volunteers helped approximately 200 individuals during monthly legal clinics at Stout Street. This is double the number of individuals that was seen in 2014. CPLP also implemented a first-of-its-kind Pro Bono Eviction Program with the Denver County Court to help indigent individuals defend eviction proceedings. In 2015, the Self Represented Litigant Center at the Denver County Court referred over 30 eviction cases to CPLP Volunteers to take on pro bono basis. The project is always looking for volunteer attorneys to help at monthly legal clinics and with the County Court Eviction Program. If you are interested in volunteering, email contact@copovertylawproject.org.